A storm was hot on our heels traveling across the Plains of St. Augustine, NM. After racing to the face of the storm we were able to capture this photo of the VLA (Very Large Array) with the dark back drop of the storm behind us. It’s a common sight for us on the way into Reserve, but the huge white dishes always look so striking against the vast flat emptiness of the New Mexico desert. Hi Will, i agree with DeRaviz 🙂 Cool dark light in the background really adds to the atmosphere. Nice image. 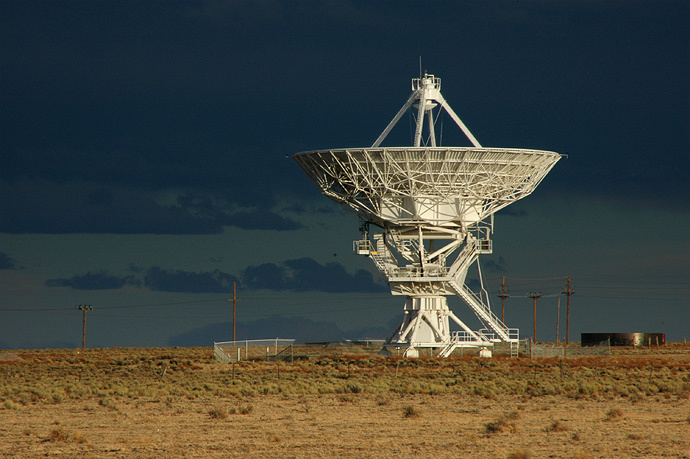 I really like how the VLA stands out against the dark, stormy background. Great shot! Could it be more alien looking? Love the color of the sky. Amazing capture.